Home Gadgets Smartphones [SALE ALERT] Up to 70% off with 3-Day Lumia Mad Rush Promo! 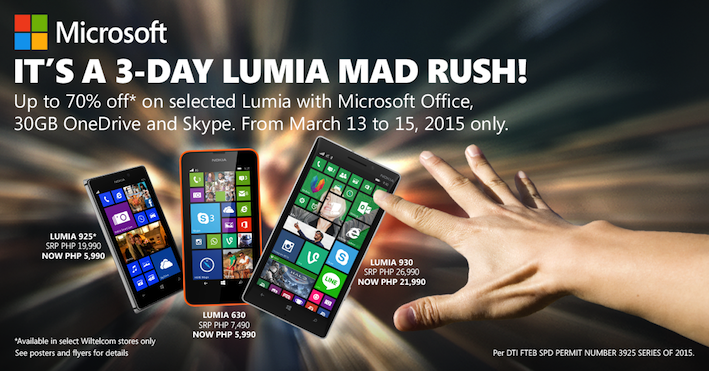 [SALE ALERT] Up to 70% off with 3-Day Lumia Mad Rush Promo! Crazy over Lumia? Make a dash for it. It’s the 3-Day Lumia Mad Rush where you can get select Lumia models for up to 70% off. Hurry over to Nokia stores and other select stores nationwide from March 13-15, 2015! Limited stocks only!